Just read an interesting post on Greg Sandow's blog. It is a letter from Klaus Heymann of Naxos detailing the future of Classical Music and delving into the financials of Naxos. I have been following your book episodes with great interest and I have also been reading your comments on Allan Kozinn's essay in the New York Times which was compulsory reading for all of us in classical music. Much of what you have to say makes a lot of sense even though I'm not nearly as pessimistic about the future of our music as you -- more about that later. What you have to say about the classical record industry, though, is not nearly as convincing. The classical record business has not become a nonprofit operation --most of the independents make a profit although it may not be the kind of profit or return on investment financial investors might be interested in. For us independents being in the classical record business is a lifestyle, that allows us to live reasonably or very well depending upon how good we are at what we're doing. And there are different business models -- most of the independent full price labels actually make money through sales of CDs and, in some cases, DVDs. Naxos being a budget-priced label has to rely on other sources of income to make a profit -- licensing, downloads/streaming, subscriptions. Quite a few of our recordings and those of our competitors are subsidized -- either by sponsors, by the taxpayer, by foundations or by the estates of composers. All of us pay our artists "almost nothing" and those of us who can afford it also buy out all the rights from the musicians. And yes, it is practically impossible to make money from selling contemporary music if it is not Adams, Glass, Corigliano and a handful of other commercially viable composers. Whether or not orchestras bear some of the costs depends on the kind of contracts they have with their musicians. In most of the rest of the world, recording is part of the musicians' salaried jobs and orchestras actually make money from recordings because they can fill empty slots in their schedules. In the United States, too, some orchestras have deals with their musicians that include a limited number of recordings for which they have to pay the musicians whether they can sell them to a label or not. Others have to find sponsors to subsidize recordings. I do object, though, to Allan Kozinn's "Dickensian pay to musicians" [although he does admit that musicians think our terms are in their interest because at least they get a fee and we pay all expenses such as travel, hotel accommodation and per diems]. "Dickensian" is defined in dictionaries as describing 'poor social and economic conditions [of the working classes]. But somehow, in the context of his contribution, he seems to imply that like the Dickensian capitalist of the past we are exploiting the poor working musicians and make a fortune from doing so. Nothing could be further from the truth -- like the musicians recording for us we don't make any money from new recordings, especially not when contemporary music is involved. Here are the facts: when we sell a CD to one of our distributors we get $2.00 [yes, $2.00] because we sell our CDs at budget price. Manufacturing cost is about 65 cents per CD which gives us a gross margin of $1.35. 35 cents go towards overhead which leaves us $1.00 per CD to pay for the investment in the recording. In other words, for every dollar we spend we have to sell one CD. When it comes to contemporary music, another 50 cents come out of the $1.00 to pay for mechanical royalties [more in the United States and Canada because there the mechanical rates are based on playing time and not on the selling price, as in the rest of the world ]. An instrumental recording costs us around $6,000.00 [$2,000.00 for the artist including expenses and $4,000.00 for production --producer/engineer, hall rental and piano rental and piano tuner if a piano is involved ]. The first 4000 copies sold pay for the cost of actually releasing the CD [cover picture and cover design; booklet notes; mastering; marketing and promotion, etc.]. This means we have to sell at least 10,000 copies to break even -- most artists understand this calculation and are happy with our business model. Composers understand it too -- and at least they get some mechanicals back if they deliver a fully paid master to us. Orchestral recordings cost us between $15,000.00 and $20,000.00 and, if copyrighted repertoire is involved, we have to pay another $3,000.00 to $5,000.00 to publishers for the right to record the repertoire [it's called "material rental" ]. You can do the numbers yourself -- with the first 4000 discs covering the release cost, we have to sell between 15,000 and 20,000 CDs to break even with public domain repertoire and double that if the works are in copyright. For example, each of the six volumes of the complete orchestral works of Barber cost us $25,000.00 to record but, on average, we've sold only about 25,000 CDs per volume -- which means we have yet to recoup our investment. On the other hand, we paid more than $100,000.00 to the publisher in material rental and mechanical copyright. The calculation is not much better for other big projects like our complete Lutoslawski and Penderecki orchestral works and many others. Then how do we make money? We're selling lots and lots of compilations -- The Best of Mozart, The Very Best of Mozart, Chill with Mozart, and so on. And there are a few evergreens that keep selling year after year -- my wife's [Takako Nishizaki's] Four Seasons has sold more than a million copies to date since it was first released in 1987 and continues to sell between 15,000 and 20,000 copies per year -- and we have another 20 or 30 titles that do almost as well. Then we license many of our recordings as background music to movie and television production companies. At the 2004 Olympics all the national anthems performed at the medal ceremonies were our recordings, generating healthy public performance income. Then there is the Internet -- many people subscribe to our naxosmusiclibrary. We are regularly the most downloaded classical label on iTunes, E-Music and others and in Germany and Japan we even had the most downloaded album across all genres [classical, pop, and rock]. This is one of the reasons why I'm optimistic about classical music -- it is doing much better on the Internet than in the record shops and in the concert halls. On iTunes, classical music accounts for 12% of revenue as compared to only 3% in the record shops [although the percentage is slightly higher in other big markets ]. This means, there are many people out there who don't go to shops to buy their classical music or to concert halls to listen but who nevertheless enjoy classical music and are willing to pay for this enjoyment. Classical music is also alive and well in Asia -- we had a record year in Japan last year -- we sold 200,000 sets of a 10-CD box with Mozart's 100 most popular works. 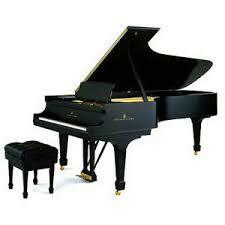 2 million pianos are sold in China every year and more than 30 million young Chinese are taking piano lessons. The market is there but people and performing arts organizations will have to learn how to adapt to changing market conditions. I think that, in the not too distant future, orchestras will have to change and become cooperatives providing all kinds of music to their communities with the cooperative providing a minimum but stable income to their musicians and with all members sharing in any profits. Orchestras will have their own chamber orchestras, modern music ensembles, chamber music groups, jazz ensembles and rock bands -- and they will enjoy a lot more support in their communities than at present. And management needs to improve in today's orchestras -- too many are run by music lovers who have no idea of how to run a business or by business people who have no idea of music. How many chief executives of orchestras and other performing arts organizations could successfully run a normal business with 150 full-time employees and turnovers of between 20 million and 100 million per year? Naxos retail prices have escalated of late. I believe the "normal" list price for the classical series is $7.99. I also note that Barnes and Noble sells their Naxos CDs for $9.99. Who is reaping the profits then? Not Naxos. Barnes and Noble makes more per CD than what a dealer would normally derive in profit. They take it from us! Continued success to both Mr. Heymann, Naxos and Marco Polo in their incredible contributions to those of us who love recorded music! Speaking as someone who's an avid fan of Naxos, I applaud this response from Heymann. I think that without Naxos and a handful of other independents, there would be a lot of great music going unheard - the 'majors' certainly wouldn't bother with composers whose work isn't neatly defined, packaged or promoted. To them, if it ain't Mozart, Beethoven or Bach (and one or two other 'big names'), it ain't worth pushing. Just look at how many sampler compilations these labels push out every year! Yes, Naxos does this, too; but it also records and releases obscure material. I'm a NAXOS fan(atic) and the current list price of $8.99 at Tower doesn't faze me at all. I get tremendous value for my dollar with that label. Mr. Heymann is that rare visionary with his feet on the ground when it comes to an art form that many with no economic stake tend to romanticize. I am concerned that Mr. Heymann has, it seems, no apparent successor who shares his values and has the experience and commitment to contnue this label's dominance. That's worrying - he isn't a young man. His letter above is reassuring in a number of ways. There is a market for both warhorses and rarely if ever performed works, ancient and contemporary. It takes vision to satisfy the diverse interests of many and nurture new acolytes. Mr. Heymann is the world's leader at both. I agree, Ralph. Had an email from him recently (which is why I know that the Naxos Live! 2007 event will be at the Wigmore Hall next year - and how I acquired Maria Kliegel's email address! ), in response to my feedback - left on the Naxos site - about the recent live concert. I directed him to this very site for my review of the evening, actually. But anyway, my point is: How many others of his standing would bother to email a customer personally? I hope his successor is a worthy one. A facinating letter. I have always wondered how Naxos operates. Certainly I was aware of the very low fees that artists get but normally they are more than happy to have themselves recorded. There is a lot of mediocre even appalling stuff on Naxos but I have bought some wonderful discs. One that jumps out at me as I type this is the recording of Elgar-s 1st symphony recorded by the BBC Phil under George Hurst. Thanks for posting this. Michael from The Colne Valley, Yorkshire. I'm a Naxos fan in many areas, but the Naxos historical series is outstanding. They're available here, but I'd still be ordering some at least if they weren't. Obert-Thorn's remastering of the 3rd Beethoven piano concerto with Solomon and Sir Adrian Boult I picked up recently is a case in point. This is good news for another avid Naxos supporter. I will continue to purchase and enjoy the label's discs, even if they aren't making a whole lot off of my purchases!